Early Literacy Center- Sensory Bags! This month I decided to put some quick and easy sensory bags in the Play-Learn-Read center. 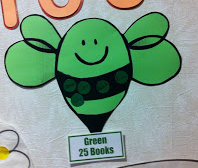 I found the inspiration for this at Mrs. Kelly's Kindergarten blog. Instead of hair gel I decided to use aloe because it was on clearance at the store. I also added duct tape and double bagged the aloe. These held up for about a week before they needed to be replaced. They take less than 5 minutes to make though, so I definitely think it was worth it. Adding food coloring and glitter like the original post recommends definitely provides the contrast you need. I included a fun literacy tip and directions. The kids love it! 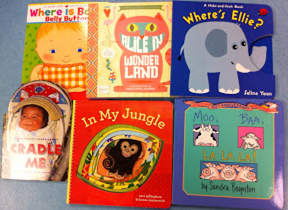 When I first came to my library they were already offering a fabulous 1,000 Books Before Kindergarten initiative. The name literally says it all. Basically, you encourage parents to read 1,000 books with their kids before kindergarten. This is a great initiative and the families in our area have responded very enthusiastically, but I felt like something was missing. Our 1,000 Books program is marketed for children between the ages of 1-5. What about the babies under one? I've found that parents of infants are constantly looking for things to do. There are very few things for infants here, especially things that don't cost money. How could we better serve this population? 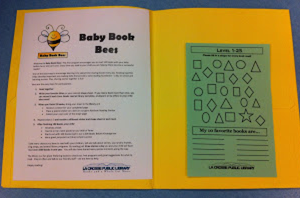 The answer was Baby Book Bees. Going off the model of 1,000 Books B4K, I decided to make it an initiative to get parents to read 100 books to their children before they turn one. 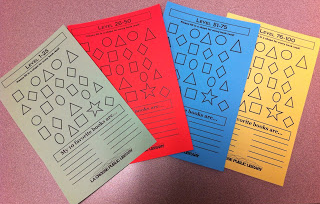 Almost identical to our new 1,000 Books sheets, I made half-sheets for our parents with 25 shapes to fill in. On the back of each sheet there are four early literacy tips. When a parent signs up, they are given a lovely yellow folder with information about the initiative, their first shape sheet, and a bib celebrating their enrollment. Once the parent has read 25 books they come back and visit us. We make a huge fuss at the desk with lots of clapping, and then we give them stickers and a new sheet. They put their sticker on our 1000 Book Garden Wall on a matching bee. Once they hit 100 books they get their own board book to keep. Plus, they are given a 100 book head-start on 1,000 Books B4K. This is a wonderful program on so many levels. First, it creates at least 4 library visits by new parents. They are beginning to establish the tradition of coming to the library on a regular basis. It also is giving parents a powerful message of how important reading is to a child at any age. Plus, once the groundwork is laid for the program, it is not staff intensive at all! To get the word out about this new initiative we decided to partner with the two local hospitals. Both hospitals give out a packet of information to each new mom during their hospital stay. We were able to get a half-sheet of information in these packets. They also agreed to put up posters in various offices that are visited frequently by new moms and in waiting rooms. We decided we wanted to start with enough material for 200 participants and bought accordingly. We predicted we would get about 100 people enrolled within our first year. We officially launched a month ago and we have 28 people signed up! There was clearly a need for this in our community and we are overwhelmed with the great responses we've had from both parents and community members. I applied for a Target Early Childhood Reading grant to get the initial funds. We were lucky enough to get chosen. If you have not looked at the grants before, please go visit. The grants are entirely online and the Target tech team is very helpful if you run into any glitches. Are you offering anything for under ones? 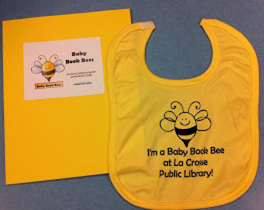 If not, you should consider Baby Book Bees! Flannel Friday-- Make a Turkey! Inspired by Miss Courtney Meets Bobo, I decided to adapt her Thanksgiving idea into our Early Literacy Center. In our ELC we have a magnetic/flannel board that we switch out every month. In October, we did a flannel decorating a pumpkin. This month, we decided to keep the holiday theme going and decorate a turkey! It is the easiest flannel activity I've ever made. First, I made 8 feathers using different colors. Then, I simply made a turkey body. I found the clip art on google images and just copied it. None of the feathers are glued on, so they are always in different patterns, on random places of the turkey's body, and sometimes our turkey friend only has one feather on. I mean, if you have a zebra print feather, do you really need anything else? I always include a quick tip for parents who won't read a full sheet of paper. For the parents who like reading more than one sentence, I also included some "Turkey Starters". I am really looking forward to hearing some turkey bedtime stories! I think this will be a great activity to use during my baby storytime too. I am going to make enough feathers for each baby. Then, I will call them up by color. The babies love to touch the flannel board, so we'll see how chaotic it becomes! Check out the Thanksgiving Edition of Flannel Friday over at 1234 More Storytimes!